Our family room is the most traditional room in our home. 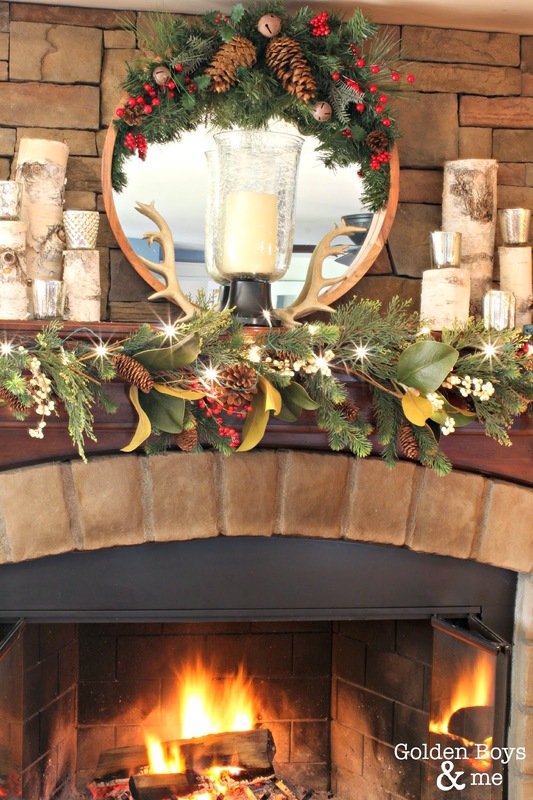 The dark wood tones on the mantel and the stone fireplace bring a rustic and comfortable vibe to the room. I decided to stay traditional on the mantel this year as well. 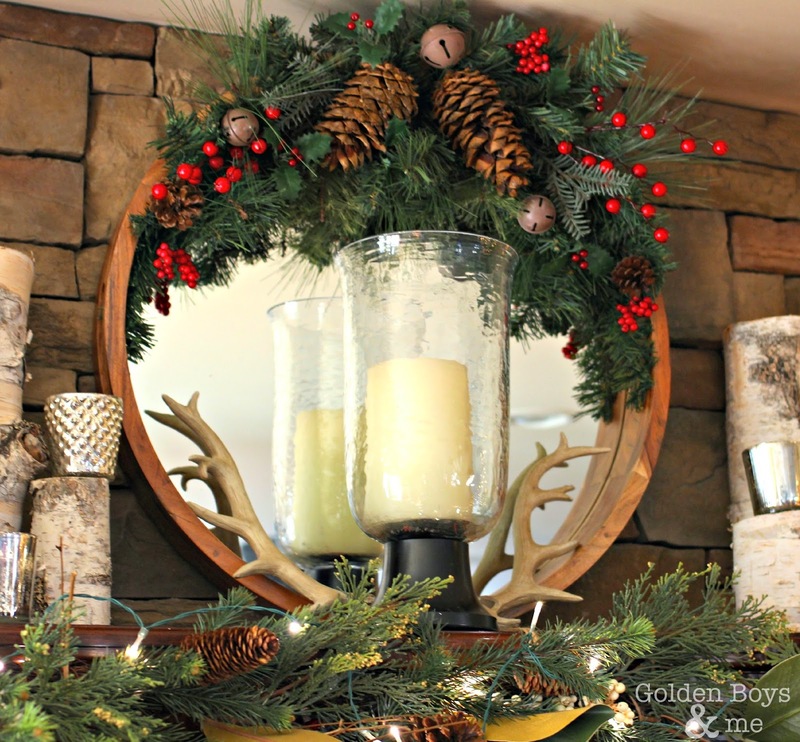 The first thing I purchased for the mantel was the round mirror. We don't have a lot of space between our mantel and ceiling but I have been looking for a mirror that would fill most of the space. Everywhere I looked, the round mirrors were too big or too small. I searched for weeks. I gave up and bought a white windowpane mirror at Hobby Lobby, but I felt like I was settling. Then, lo and behold, I saw this mirror tray at HomeGoods sitting on the shelf and I actually may have heard angels sing when it measured just the right size. After wrestling with the garland to get it to hang right (Command hooks just weren't working for me here), I added some battery powered LED lights. Then, I just added a couple of lanterns that were already in the family room and the seeded glass hurricane. I used to have 2 of those seeded glass hurricanes from Crate & Barrel and I may have cried when there was an unfortunate accident with the glass and a toy light saber. They are no longer available at Crate & Barrel, but I do check every now and again to see if they get them in. I added a few cut up birch logs and some small mercury glass votives (from Marshalls) for shine. And the antlers, for rustic-ness, to balance it all out. I found the old wooden skis this past summer at an Upstate NY auction/outlet. I have seen lots of expensive wooden skis in antique stores and even the Pottery Barn catalog. These were just $15 and they have a lovely patina on them. It was a good day when we found them! 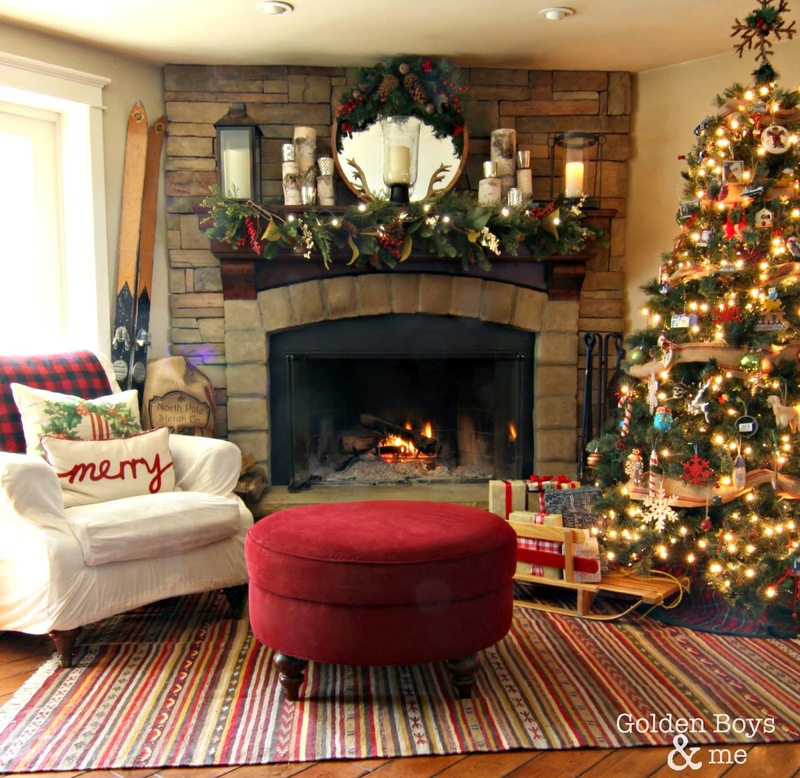 I can't wait to show you the rest of the family room! Here is a sneak peek. Want to see more of our holiday home? Here are some links. It's beautiful, Courtney! Your family room is such a warm and inviting space. I love the stone on your fireplace. 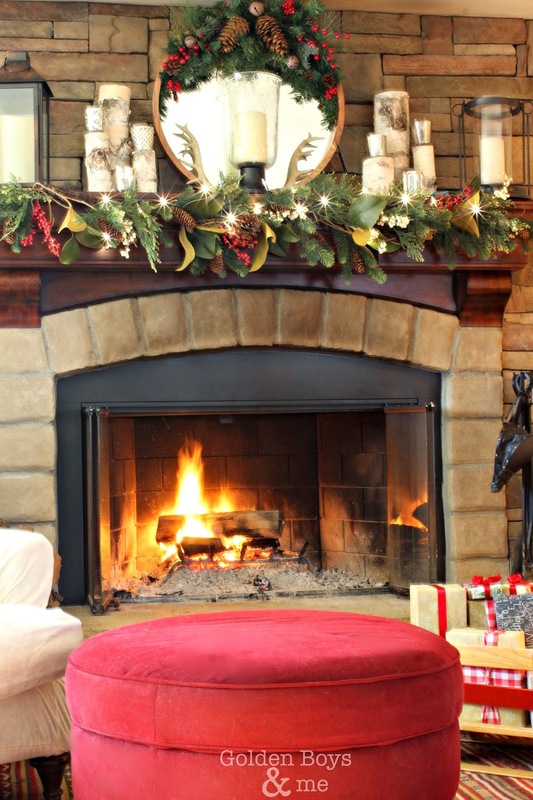 I think if we were going to do anything to our fireplace it would be a stone surround. Great find on the tray to use as a mirror. I'm never happy when I feel like I've bought something just to fill a spot. Or as you say, you feel like you "settled". Sometimes it pays to wait for that special item to appear. Your tree looks gorgeous, too. I'm looking forward to seeing the rest of the room. Thank you! Exactly, I put the other mirror on the fireplace and it just felt wrong every time I looked at it. Can’t wait to share the rest of the room. It is feeling very cozy in here. 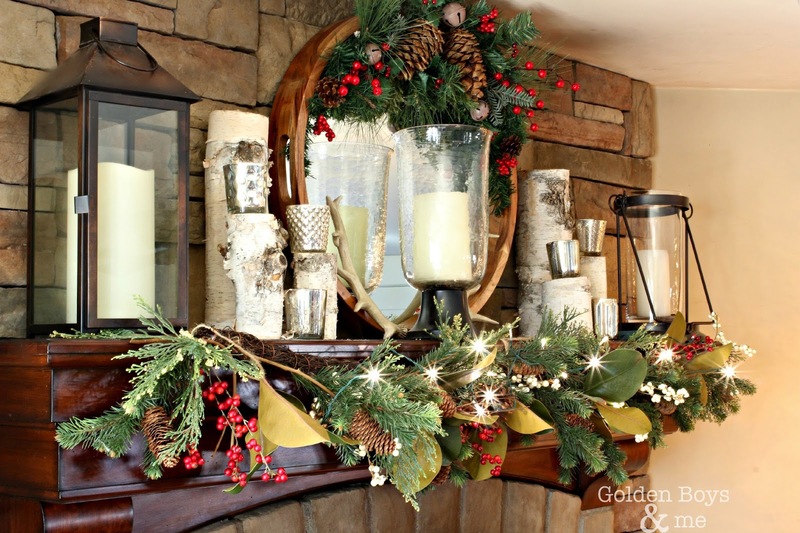 Your mantel is gorgeous. I love the round mirrored tray for a mirror. SCORE! Gotta love Home Goods! 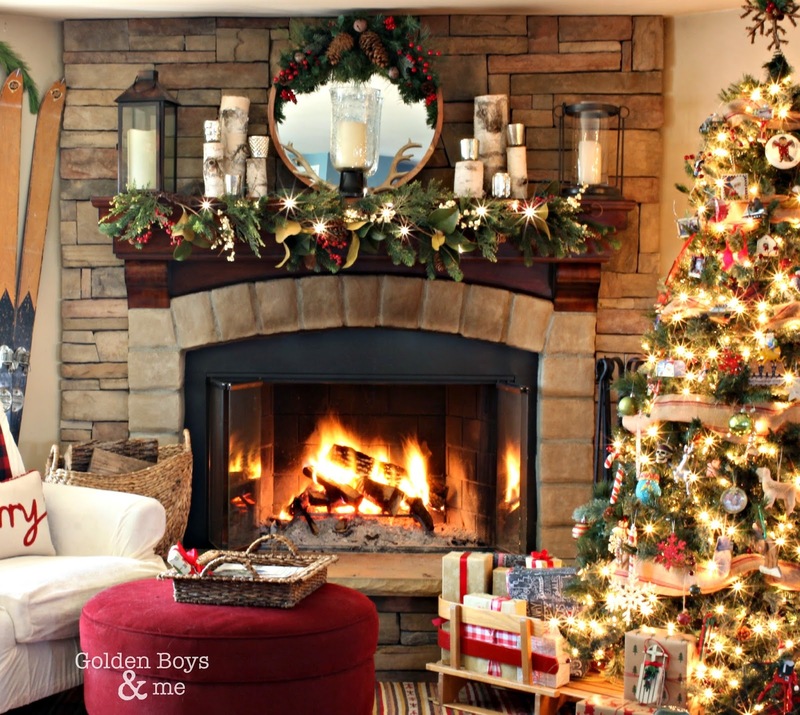 Your family room is so cozy and warm for Christmas. Love it all. Thank you! I was so excited to find that mirrored tray. It will be such a versatile piece. Thank you so much, Susie! I am a big fan of Better Homes and Gardens so that is a huge compliment. Have a great day! Oh Courtney it looks so beautiful! Now are you are holding out on me..is there a pottery barn outlet here in NJ that I don't know about? I always wish that there was one here. I can't wait to see the rest of your beautiful home! Thanks so much!! Unfortunately, there is still no Pottery Barn Outlet in NJ :(. I so wish they would open one nearby, but even the Williams Sonoma outlet closed at Woodbury Commons. The one I went to was on Long Island in Riverhead. It’s a beautiful, big store but too far away. Can’t wait to share the rest of our Christmas home. Thanks for the visit! 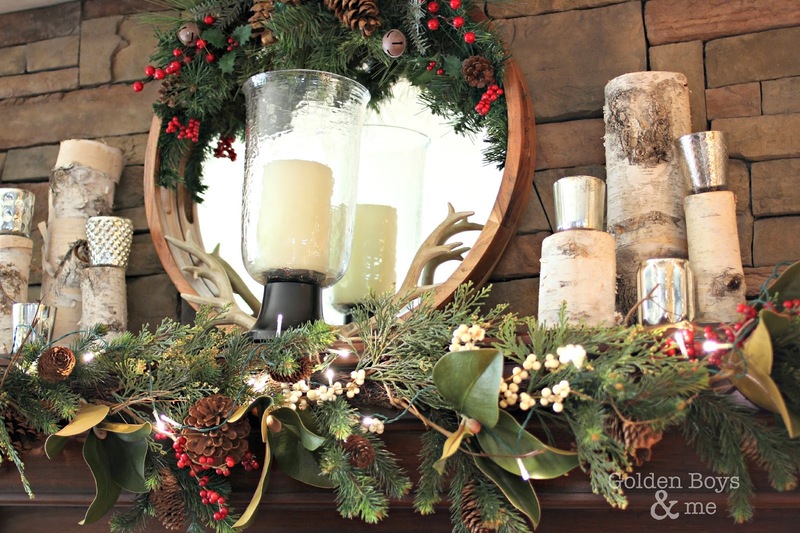 What a gorgeous mantel!! The round mirror tray is the perfect centerpiece. Can you tell me where you found the swag on the top? I love the rusted bells and it looks so full! Thanks. Thank you!! The swag on top of the mirror was also found at HomeGoods. It is a really nice swag for the price ($10ish). Hope you can find one at your local store! Courtney.... this room is just beautiful.. I can't wait to see more! Happy Holidays! Thank you, Andrea! I will be sharing more very soon. Happy Holidays!! Absolutely gorgeous, Courtney...magazine worthy! You did a wonderful job creating a lovely space for your family to gather! Thank you so much! We are looking forward to gathering in this space for the whole Christmas season. 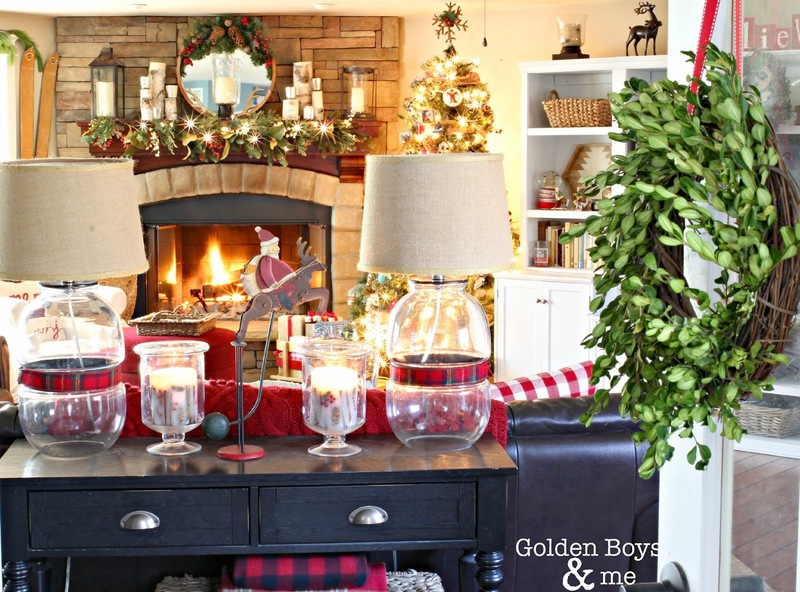 I've said it before ..your Christmas mantel is the BEST!! I just love the wood & stone coloring & pretty much EVERYTHING!! LOVE it Courtney! The round mirror looks so pretty and I love how you decorated it. I always struggle with decorating my round mirror so I may do something like you did on top. Great job and such a cozy room! Thanks Lisa! The rug is from Ikea. We just recently added it to this room and I am loving it.